AxCent® provides the aerodynamic design of flow path and blading. Three-dimensional blading and flow path design can be quickly developed using available 2D flow solvers (throughflow and blade-to-blade). These solvers run in seconds, allowing rapid convergence from initial design to good loadings and performance. 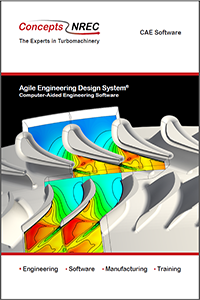 AxCent® is a powerful, full-featured design, analysis and geometry generation tool for single and multistage axial, radial, and mixed-flow turbomachinery. AxCent easily handles the most complex rotating and stationary blade geometry. Features include parameterized volute geometry generation, split-duct geometry, and fillets with constant or variable radius and aspect ratio. Users can see design edits in real-time with cutaway and 3D-transparent overlay views. AxCent also includes several 2D fluid dynamic solvers for aero/hydrodynamic performance that update as the geometry is changed. FINE/pbCFD is a baseline tool for CFD users who are interested in a cost-effective alternative to prototype manufacturing and testing. It is designed to quickly and accurately optimize product efficiency and functionality from within AxCent. 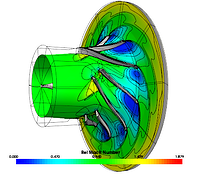 FINE/Turbo is a full-featured Flow Integrated Environment for rotating and non-rotating flow analysis in external and internal turbomachinery applications. 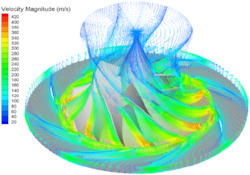 It is the fastest CFD suite available for rotating machinery with incompressible and compressible fluids, operating from subsonic to hypersonic flow regimes. All types of multi-stage axial, radial or mixed-flow configurations are supported: compressors, turbines, pumps, fans, propellers or contra-rotating propellers. FINE/Turbo seamlessly launches with one click from AxCent. Pushbutton FEA™ enables aerodynamic and structural design to be performed concurrently within AxCent® utilizing the integrated FEA tools. Since this can be done as soon as initial blade definition is available, structural analysis and life assessment can be performed earlier in the design process. Above all, Pushbutton FEA is designed to be simple and intuitive for the non-FEA professional, while still providing the necessary power and flexibility for the structural design professional. Our pbPost post-processing module saves designers the time they might spend loading geometry, applying boundary conditions, gridding and configuring solvers inside a second interface. PbPost just requires a click of a mouse. PbPost bring the CFD results from FINE/Turbo back into AxCent to deliver a designer-centric view of the analysis that doesn't require any navigation. The tools are intuitive and focused on what turbomachinery designers need.